London, February 26, 2018 – We are very excited to announce the launch of our newly designed website dedicated solely to our video collaboration and conferencing solutions for corporate workspaces and higher education. The new website marks our commitment to expand the collaboration solutions business, which are critical to performance and productivity on any project. It not only inspires innovative approaches to workplace efficiency, but also leads to quick decision making. With the growth of video conferencing systems and software, employees can now collaborate from anywhere at any time using minimal resources. 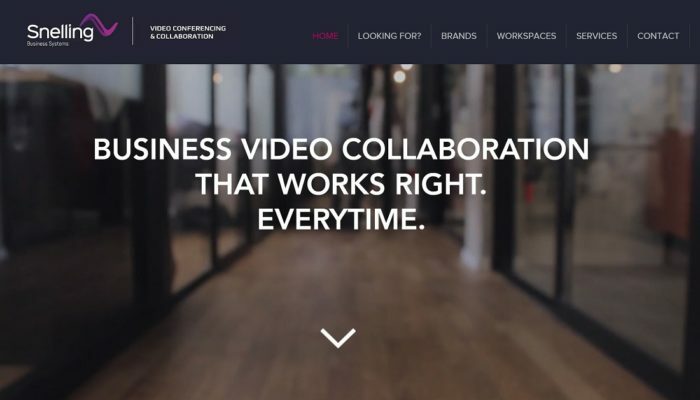 Speaking about the new website, Toby Wise, Managing Director said “We have observed rapid growth in demand for our solutions for video collaboration and conferencing. Having an online presence dedicated to inform new and existing clients of our capabilities and solutions made perfect sense”. Click here to explore our brand new web presence for Snelling Collaboration. Norwich, February 21, 2018 – Snelling Business Systems have announced their successful bid for the provision of building-wide audio visual systems and services at the brand new Quadram Institute. The benchmark project is part of the world-class bioscience cluster based at the Norwich Research Park (NRP). The appointment follows other successful projects delivered by Snelling Business Systems at the NRP. Speaking about the appointment, Steve Royans, Business Development Director at Snelling said “This is a well-rounded AV fit-out project, aimed at a multitude of user groups. While our mandate covers the provision of AV infrastructure for clinical and academic teaching spaces, the Institute’s close links with the food and pharmaceutical industry also emphasises the provision of enterprise-quality video conferencing and collaboration facilities”. London, January 21, 2017 – Snelling Business Systems have announced the appointment of Rob Welsby as the Video Conferencing & Collaboration Solutions Specialist for Corporate Solutions. Rob will be responsible for developing SBS’s VC & Collaboration solutions footprint, and building new client relationships across the corporate sector. “He has a strong background and interest in the scope of collaboration solutions we bring to our corporate clients. He has the drive, aptitude and experience we seek for developing strong business relationships, while ensuring our clients remain at the forefront of technological developments. I am looking forward to working with him to drive our business forward”, said Toby Wise, Managing Director at Snelling Business Systems. Speaking about his appointment, Rob said “For 2018 -19, we have ambitious plans for further growth within the collaboration & VC space. My role entails driving growth within the commercial sector in London and South-East, working alongside our existing technology partners and creating relationships with new suppliers and clients”. The Display Trends Forum EMEA Partner Awards recognises exceptional achievements by NEC’s most successful channel partners operating across display and projection solutions for various vertical applications. At the ceremony, Helen Sheldrake, UK Channel Sales Manager at NEC said, “Snelling Business Systems has always proven to be an innovative partner and is one of the fastest growing integrators in the UK. Their professional, knowledgeable and friendly team makes SBS a pleasure to work with and I’m sure it will be another busy year ahead for them with many exciting new projects. I look forward to continuing to build on a great partnership”. Norwich, June 05, 2017 –Snelling Business Systems have confirmed the appointment two new Account Managers to further strengthen business activity across key sectors. Joining the Snelling team are Karl Tamegger, formerly Senior Business Account Manager at Epson UK, and Elaine Manalo, formerly Project Manager at global AV consultants Hewshott International. The new appointments come as part of recent internal restructuring within the company, and to replace recent moves from business development and account management. Explaining the significance of the new appointments, Steve Royans, Business Development Director, said “Their role within Snelling will continue to forge our strong client and consultant relations, which will prove key as we continue to take a greater share of the Audio Visual and Unified Communications market. I am confident their outstanding industry credentials and breadth of expertise will add a further dimension to our customer offer. I’m delighted to welcome Elaine and Karl to Snelling”.